Thank you to members and guests who participated in our annual Sailpast this past Saturday. It was the perfect day, with great food, drinks, music and, of course, company! To see some of the photos from the event please click here. "Best lead sailboat”, James Fair in his Opti. “Best Overage sailor in an Opti”, Erika Vines. “it takes a village”, Force Ten for the 14 person crew. “ziggin-zaggen”- just way too fast”, Peter van Rossem in VX. "Best Ole” best makeup, Ramble On. “perfectly timed dip”, Take Five,4,3,2,1,dip! “most abundant crew on a foredeck”, Quin Red. “Trillium Award” our new RIBS, piloted by Nick and Cole. “Most travelled Award”, Tony Zegers on Windharp. “most Intrepid Manager with new sea legs”, Greg McNab, on Kibitka. “best Amish beard”, Peter Fedora. “loneliest blue boats”, Wynsum and la Galouine. and last but never least. “le bateau d'un certain age:, Bagatelle. The Food & Beverage Fair is on Saturday June 20th and will feature new food ideas from Chef Neil's kitchen and wine and beer sampling from KYC's suppliers. The event runs from 6 to 9pm. This is a great chance to find out about what we have in store for the club this summer or introduced new people to KYC. Members are $20 and non-members are $25. Please e-mail James at bar@kingstonyachtclub.ca to reserve. This week our feature draft tap is back by popular demand! We are featuring Smithworks Brewing Company's Dunkelweiss, a complex, yet refreshing dark wheat beer. This coming Saturday we have the Single/Doubled race and the following Saturday the Harbour race. The greater the turnout the more fun it is for all! If you want to race, you can either show up on Tuesday/Thursday between 5 - 5:30 pm and put your name on the white board near the bar to race that evening or send email to the Race Office at race@kingstonyachtclub.com for future matching with a boat. RC Duties have been assigned to boats for unfilled weeknight and weekend slots. Please communicate any swaps by email to the Race Office. Each boat participating in KYC club is obliged to perform 2 duties per year. The Sailing Instructions (available online in the Racers' Handbook) provide details. There have been requests to modify the policy for special circumstances. Changes are being considered and will be communicated in due course. Finally, the online RC Duty schedule is the master. RCYC has invited us to participate in their Ideal 18 Invitation Regatta. The format is 2-person crews, from 10-11 yacht clubs, racing in Ideal 18 boats provided by RCYC onSaturday July 25. It looks like a great event. 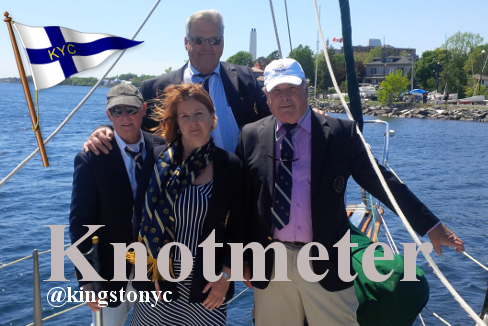 If you are interested in learning more or participating please contact ken.martin@kingstonyachtclub.com. I was asked to write a post for the knot meter and in writing it, I’ve realized that while many of you have probably seen me around the club the past few years, I’ve never properly introduced myself. My name is Rob Frost and I am the High Performance coach here at KYC. I am a full time coach with the Ontario Sailing Association and have been appointed to be the Regional Training Center Coach here at KYC. I spend April to August running training for our KYC athletes, September to October running the Queens Sailing team and the remainder of the year running training for the Ontario Sailing Team in Florida over the winter. I have been a coach for almost 15 years, and graduated in 2011 from Lakehead University with an Education Degree. During some of that time I was campaigning in the Olympic Class 49er. Here at KYC I spend most of my time working with double handed and skiffs, but also lasers in the spring. My goal at KYC is to guide young sailors into high performing athletes and create a winning atmosphere. My dream is to have the next Canadian Medalist come from KYC. Over the past couple years I’ve been working closely with some of our young dedicated athletes who may just be our next medalist. In future Knotmeter posts I’ll introduce some of these sailors and keep you updated on their progress on racing this summer. In closing most of my time at KYC is spent either on the water or in the boat park. If you’re around and would like to talk sailing or you’re an athlete and you want to be that next medalist from KYC, come find me and I’ll get you started! Robert and Judith MacKenzie are hosting Cruising Fleet members, and other KYC members who are interested in participating, at their summer home on Amherst Island this Saturday, June 13, 2015. Please advise Judith and Robert by email at robertmackenzie@bell.net if you are planning to participate. 2015 Member Cards and Stickers are Here! KYC radio control fleets will be hosting the Soling One Meter Canadian Championships this weekend weekend off the breakwater. 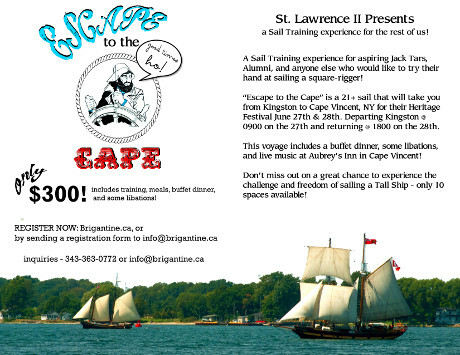 Registration and practice sailing will take place on Friday June 12 with racing all day on Saturday and Sunday. Approximately 20 boats are expected from Nova Scotia, Quebec, Ontario and several locations in the USA. We are looking forward to hosting this event and wish all of the participants luck in the races!